CAPE ELIZABETH—Erik Christiansen propelled the Lakers ahead of the Capers 3-2 in the top of the seventh on Friday afternoon, April 12, knocking a double into rightfield and scoring teammates Logan Davis and Hayden Tremblay. After struggling to generate offense for five innings – and after falling behind 2-0 in the third – Lake Region finally found a groove in the sixth, then capitalized in a big way on their last ups to capture a season-opening W.
The Lakers opened the bout looking flat: Christiansen and Ryan Walker struck out to kick things off, and Chase Weese grounded out to third. The Capers didn’t fare much better, though. Walker on the mound for LRHS lured Cole Hoffman into a flyout into left, then struck out Will Altenburg. Walker hit Jameson Bakke for Cape’s first baserunner, but Ryan Oberholtzer closed the inning when he grounded to Laker Noah Duprey (at second for the Lakers) and Duprey flipped the ball to Mark Mayo (at first). The second looked much like the first had, but the third – the third is when Cape made their move. Hoffman flied out to center at the start of the stretch, but Walker then hit Altenburg with a pitch, handing him 90 feet. Bakke and Oberholtzer also found their way onto base, and the home team took a 2-0 lead when Jake Tinsman smacked a double. The score hung there through the fourth (which is when Isaac Holland hopped onto the mound for Lake Region), as well as the fifth and the sixth. 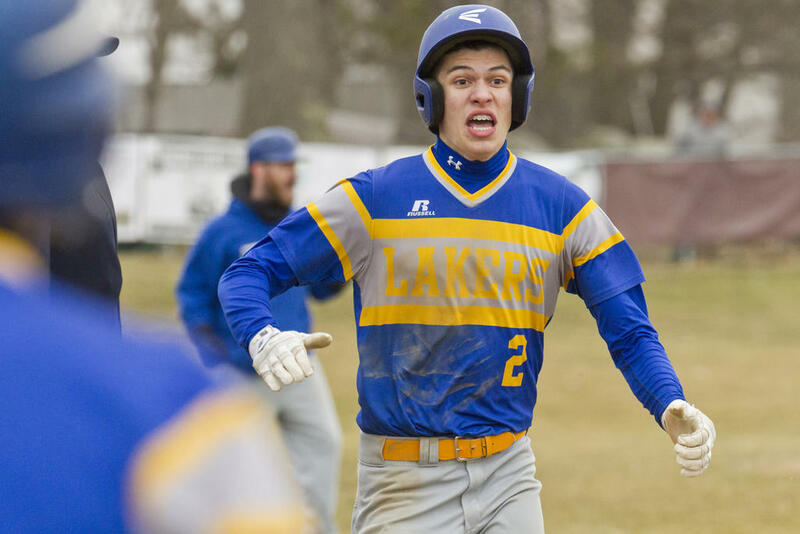 The Lakers began to wake up in the sixth, with Walker walking on, then stealing second during Weese’s at-bat and beating a fielder’s choice to third when Weese grounded a single toward shallow centerfield. Alas: Mayo popped up to the Cape pitcher (Oberholtzer), Dan Symonds grounded out to second, and the inning crashed to a halt. Oberholtzer hit Holland with a hurl at the start of the seventh, giving Lake Region an early man on; Holland stole second during Davis’s turn in the box, then rounded to home when Davis volleyed a deep double to centerfield. Tremblay followed Davis onto base, and both boys shortly advanced, putting them in scoring position for Christiansen. Christiansen’s shot to right secured the lead for LRHS, but they still had to get through the bottom of the seventh unscathed – which they did. Holland opened with a K, then inched his boys another out closer with a gentle throw to first on a little infield grounder by Hoffman. Holland walked Altenburg next, but regained his composure and got Bakke swinging to end the contest. Lake Region opens the season at 1-0. The team travels to Morse on Friday, April 19. An excited Hayden Tremblay arrives home, the go-ahead run for Lake Region in their seventh-inning comeback-win. Mark Mayo turned in an excellent effort at first base for the Lakers. Logan Davis leaps off third; he would shortly score the Lakers second run. Isaac Holland scores the Lakers’ first run, in the top of the seventh. Ryan Walker wouldn’t quite score here in the top of the sixth; no: The Lakers wouldn’t get on the board until the top of the seventh, when they surged ahead. Chase Weese takes a cut at the ball. LRHS second baseman Noah Dupry fires toward first on a Cape grounder. Erik Christiansen lines up at the plate for the Lakers. Isaac Holland stepped in mid-game to guide LRHS on to victory. Isaac Holland trots off the mound immediately after Lake Region closed out their 3-2 victory.